So, there I am. Egged on by Havant & Waterlooville’s reserve goalkeeper, attending this game in support of his ex-Academy colleagues. So, there I am, responding to his call of “come and join us, Skiffy” like I’m some kind of road-safety squirrel or a bush kangaroo. Not too sure of that cutening of my nickname by our second-string custodian. I should have insisted that while Kevin Scriven can call me Skiffy, he should address me as ‘sir’. These retorts always come about twenty-fours too late. Not that, as a moustachioed, mortar-boarded, stern type I approved of some of the less savoury chants coming from our teenage stiffs; what they were suggesting West Leigh Park was full of to make it wonderful, for example. It is with great regret that I write that they believe it to be packed with “t**s, f***y and football”. However, when I registered my disgust with the absent guestStepping troubadour Young Adrian later in the week, his reply was “Full of? Frankly I’d like to see more of it”. In a way, that’s why the Hawk London Branch decided on this being our midweek tickle over the first team’s Setanta Shield game the following night. Chelmsford and Crawley aside it’s been quite a frustrating season watching the old yins. 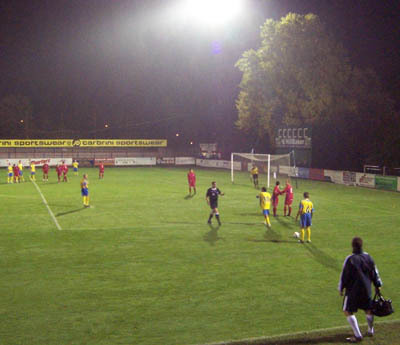 Also reaching the propers of the FA Youth Cup is quite a big thing for our Academy side, as it is structured similarly to the FA’s other Cup, the one that isn’t suitable for minors (well, not just for them anyway). As such, they found themselves two wins away from potentially facing Manchester United Youth or some other bunch of Borstal nerks. Years ago when I still lived in Havant I made a semi-regular Sunday habit of watching our youth team, then managed by non-league legend Dave Leworthy, and why not? That side won every competition they entered that season, the club’s trophy cabinet collapsing under the weight of various mugs, shields and ‘best-in-show’ rosettes. However, it wasn’t quite the breeding ground we had hoped for, with most of that side now either plying their trade in the Wessex League or lost to the game completely. On top of that, when Dave Leworthy made the step-up to first team gaffer, his tenure was to last only ten months. On taking over the first-team helm, Ian Baird’s cost/benefit analysis printout read simply “HOW MUCH!?! ?” and both the youth and reserve sides were disbanded. However in the last two years, the club has established a relationship with the local South Downs College and thus we have a handsomely attired Academy side. As you may have gathered above, there’s a ladies side as well, but that’s a separate concern. On paper, Aldershot Town away from home, a Football League club these days after all, and on their main pitch, would have seemed quite tough a proposition, but with three players who have featured in the senior side this season (albeit only in a Hampshire Senior Cup defeat to VTFC), our boys were well drilled for the encounter, going at Aldershot from the kick-off and taking a lead in the second minute, via Alex Baldacchino’s swede. In a brief setback Aldershot equalised almost instantly, courtesy a gorgeous thirty-yard drive by Adam Mekki, much to the delight of the single Aldershot Ultra stood behind the goal next to us surrounded by about five flags, the one on a stick being so massive you could have swaddled a couple of rhinos in it. 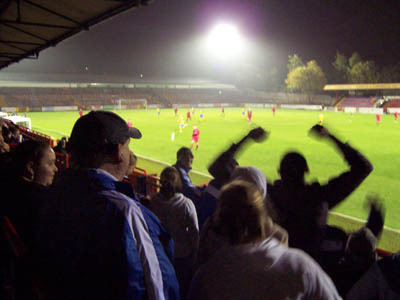 Clearly for us and Aldershot, this season is all about the FA Youth Cup. 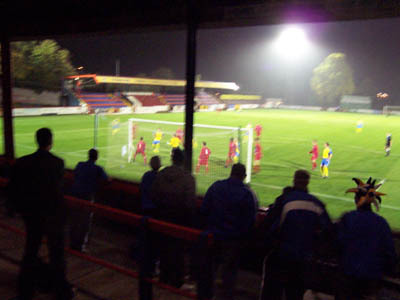 However, it is for Aldershot no longer as after weathering a brief period of pressure, the toddling Hawks took control. On twenty-three minutes, Jack Farrugia barrelled through Aldershot keeper Matt Peglar to re-take the lead. Perhaps unsurprising that our opening goals came from ‘Cappuccino’ and ‘Fudge’ given they are two of those who have tasted first team action. Seeing this, some of the others were clearly keen to impress, with Tony Lumb calmly finishing for the third just after the half hour then, early in the second half, after Peglar mis-timed a kick against him, Craig Ralph slotted home into the empty-net from the edge of the box, getting the strength of his shot just right given the ball could well have held up on the increasingly drizzle-sodden pitch. After that, the youth didn’t look in danger and not even a second yellow card for Tony Lumb (Aldershot’s Carlton Cox departing at the same time) could dampen the enthusiasm, the on-pitch celebrations showing it meant to make it to the second round, where they would play away again against another League Two club’s youth side, in this case Barnet. *since this article was written, Jack 'Fudge' Ferrugia was involved in a nasty car crash and is at the start of what may be a long period of recovery. dubSteps naturally wishes Jack all the best and hope he's back to putting in quality displays, such as that against Aldershot, in the future. I see H&W have drawn Lewes away in the FA Trophy 2nd Rd (providing they progress). If you want to meet up with a fellow blogist then I shall be at that match (Jan 10th). Let me know old chap. Unfortunately due to a prior commitment I'm not going to be able to make it to Lewes. More's the pity - I had thought Trophy weekend was the 17th. Schoolboy error. Enjoy the game. Hopefully we'll have got a bit of form by then!